This was probably one of the few cases when a movie is better than the book. 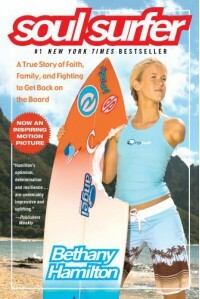 Bethany Hamilton is proof of overcoming a handicap and enjoying life and what you do. The writing itself was bad - I understand that Bethany was 14 when the book was published but she also had the help of two writers - thus being said the book could have been a much better story - a story of overcoming and love. Instead it turned into a preach-book. I get that she is religious but mentioning faith, God (this word alone was mentioned 85 times!) or Christ every few pages was too much for me. Long story short "Yeah a shark had bitten my arm off but I have Jesus so I'm OK".